Didn't think I'd remember, did you!? Almost didn't since I don't usually post on Sundays! 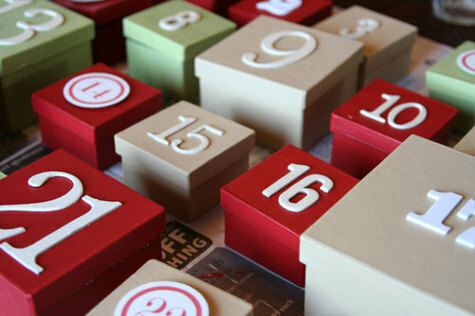 Here is Advent Calendar #2. And here it is on the wall. Found this at Ali Edwards' blog. She got the idea from Martha but switched the colors for more traditional holiday colors, which works better for me. I also like that Ali used various types of numbers. Very cute! More from her about making the boxes here. She also blogged about a nice alternative to candy or gifts in the boxes. Strips of paper with various activities that prompt the holiday spirit. Scroll down in her post to read about it and even download ideas. 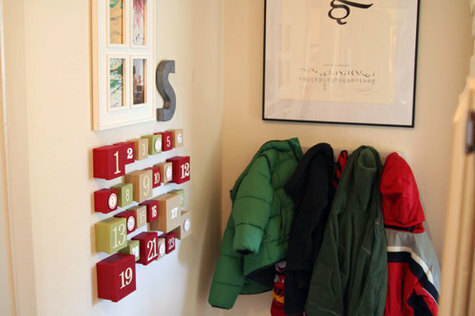 Check out some of Ali's other wonderful holiday projects, too. Wish I could find the time to do all of these things! So lovely! This is adorable! I love your taste!